To the southwest of Kiev, in the picturesque setting of Pirogovo village there is an open-air Museum of Ukrainian Folk Architecture, Rural Life and Folk Art, stretching on the vast territory of 150 hectares. In this village-museum the unique collection of folk architecture from all regions of Ukraine has been gathered. The visitors to the museum are welcome not only to admire rare exhibits but also visit folk crafts shops and a traditional restaurant serving Ukrainian cuisine. museum has accumulated a rich collection of over 200 structures, some of which were brought there from various parts of the country. Some exhibits are replicas of typical traditional buildings. The museum also boasts an impressive 40,000 collection of ethnographic exhibits, among which there are folk costumes, fabrics, embroidery, carpets, ceramics, articles of metal, wood, glassware, musical instruments, paintings, tools and household articles. It is significant to note that the considerable amount of items are set out not in the modern exhibition halls, but in the peasant buildings, so the visitors can not only visualize but see with their own eyes how people lived a century or two ago. The museum's exhibition is divided in two departments: Architecture and Life in the Ukrainian Village before the Revolution and Folk Architecture and Life in the Socialist Village. The first part of the exhibition represents the culture and the way of life of six important regions: Middle Dnepr area (Naddnepryanshina), Poltava area (Poltavshina) and Slobodian Ukraine (Slobozhanshchina), Polesye, Podolia, the Carpathians (Karpaty) and Southern Ukraine. 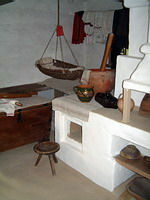 The exhibition includes traditional houses with all necessary utensils, barns, wills and even typical for that specific region trees and plants. many of centuries-old folk traditions were ruined or somehow transformed, others on the contrary were carefully cherished. Besides, the new social order resulted in the introduction of new tools, techniques and building materials. The Folk Architecture and Life in the Socialist Village exhibition occupies the territory of over 13 hectares, where houses and domestic buildings, dating from the 60s and 70s of the 20th century, are arranged according to the ethnographic and administrative principles. The architectural and landscape panorama is supplemented with the wooden churches. The oldest one is Naddnepryanskaya Church, dating back to the year of 1742. The compositional center of the museum's ensemble is a collection of windmills on the top of the hill. In summer and fall the museum hosts special craft festivals. During these days the blacksmiths, potters, coppers, weavers, carpet makers and other craftsmen of the present demonstrate how the masters of the past created their masterpieces of applied art. On Sundays everybody is welcome at concerts of Ukrainian folk music held in the museum.